This photo of a bear is a good example of how and why we should do this. Most people see or take photos of bears from a distance because they are scared of them. 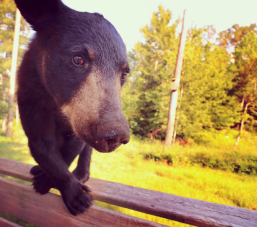 During a bear field course last month we learned all the reasons we should not be scared of black bears and we were given the opportunity to get close to them. So I decided to take advantage of this new perspective on bears and use a 10mm wide angle lens instead of a telephoto lens. The results were quite fun and surprising. We can do that in our own lives as well. Is there something you are scared of that might actually help you or be surprisingly refreshing? What about rock climbing? A drumming circle? A meditation group? Swimming? Just as using a different lens makes the bear look different, getting a different perspective on life will make your life look different too. This can help you unearth issues that were hidden, discover new and energizing activities, break a physical and emotional cycle of depression or even eliminate pain by moving your body in completely new ways.